If you would like to protect yourself from bed bugs but don't know how, you are likely wondering what steps will let you keep the parasites away from your home or workplace. Bed bugs won't cause diseases or lasting damage to people, but they are stressful invaders that you should avoid. They will hide in your home and wait until you fall asleep to consume a blood meal, which leaves red marks on your skin. With the correct approach and a little dedication, you can go a long way to reduce your odds of experiencing a bed bug infestation. Putting in the effort to discover how bed bugs act when they invade a home will work wonders when your mission is to decrease your odds of facing these pests. In most cases, they do their best to avoid lights and loud noises so that nobody will detect them. The carbon dioxide from your breath is a beacon that attracts bed bugs to you at night. Although they prefer to consume a blood meal while the host is asleep, bed bugs will strike during the day if they are desperate for food. With a basic understanding of bed bug behavior, you can take proactive steps to safeguard your property. If you are like most people who want to combat bed bugs, you probably think that the invaders will only want to live in your mattress. Bed bugs strive to be as close as possible to their host so that they won't need to travel far to get a meal, but they can also nest in other parts of your home, such as behind walls, in power outlets and in the furniture. Take a flashlight and look in those spots if you think you are the target of a bed bug infestation, and you might spot the warning signs before it's too late to respond. You won't always see the bed bugs if the population is small, but you will likely notice discarded shells and blood stains if they have recently fed. 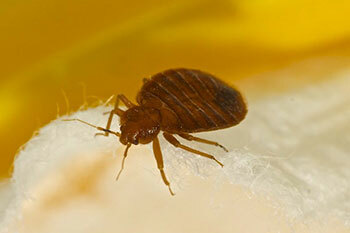 Getting rid of bed bugs after they have entered your home or place of business won't be easy. Preventing them, though, is not as hard as some people would like to think if they know what to do and what to avoid. Always take a flashlight when you stay at hotels so that you can check the seams of the mattress for red flags. Putting your clothes on the sink of your hotel room will prevent bed bugs from getting on them because the pests can't climb smooth surfaces. Place your clothes in the dryer when you get home, and turn it to the hottest setting for 45 to 60 minutes to kill bed bugs and their eggs. Taking this advice will get you moving in the right direction and stop you from worrying about becoming the next target. No matter how many steps you take to stop bed bugs from making trouble in your home, you won't replace the results of a trained pest control team. At Germantown Pest Control & Termite, we always keep the needs of each customer at the front of our minds so that we can get the job done right the first time. Our training and equipment allow us to discover bed bugs and treat them before they have the opportunity to spread. If you don't want to take risks when it comes to these parasites, pick up your phone and contact us right away for a free quote.